How does a season produced by the tilts of poles and the presence of climate cycles attach itself to our lives? There is a July on Venus, a spring on Mars, but no one there to witness it. But winter . . . love it or hate it, is indeed noticeable. Winter has the power to make the bittersweet and the bleak sublime. “Romantic Winter” depicts images from cozy to scary as we are introduced to historical winter through the many poets, artists, and writers who found inspiration in the season. What makes winter magical is, in part, that you can project onto its forms of ice and snow anything you want to see. 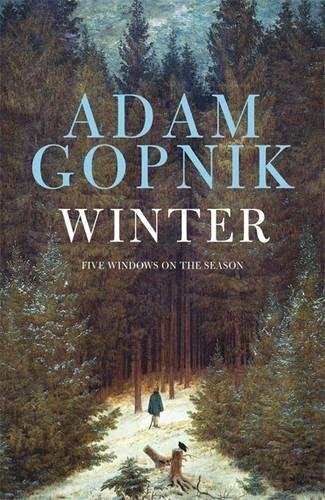 Through the works of Coleridge, Edmund Burke, Vivaldi, and others, Mr. Gopnik takes us through a history of the human perception of winter and its power. “Radical Winter” reveals the rich detail in Mr. Gopnik’s writing as he takes the reader to the open polar sea to explore the struggles and myths of Shackleton and others who, intrigued about exploring the eternal winter of the polar regions, journeyed to the North Pole to see what they would find. Along the way, Mr. Gopnik writes of winter, bounded by spring and fall, with remarkable alacrity, even contrasting icebergs and snowflakes as only he can. As the author contemplates works of literature and art depicting winter and the effects of central heating, he writes thoughtfully of the miracle, metaphor, poetry, and science of winter, when “once you were warm, winter became a thing to see rather than feel. “Recuperative Winter” is made bearable for many by the modern Christmas holiday, also celebrated as winter solstice, Hanukkah, and the ancient festival, Saturnalia. Mr. Gopnik weaves together a history of winter holidays, politics, cultures, literature, and a well-researched study of Christmas. “Recreational Winter” began when people realized winter impeded comfort but accelerated movement. Suddenly, winter became a season of speed and play. Sports developed on skis, skates, sleds, and sleighs invented as ways of moving through winter and staying warm outdoors. Mr. Gopnik tells stories of both the dignity and absurdity of romantic era painters, including Goethe, skating to exhibit their skill to admiring, bundled-up women. Whatever your thoughts of winter, you’ll enjoy reading of the ways in which winter touches memories. In one, winter displaces us from the normal cycles of nature for an escape into the mind. When the snows of winter become the sands of the memory clock, winter creates a sense of past time as well as of time passing. Winter is a soulful, studied meditation on the season that most captures our imagination. The book is complete with charming historical photos, a full bibliography, and a detailed index. Helen Gallagher is a national speaker on technology, writing, and publishing. She is a member of American Society of Journalists & Authors, the International Women’s Writing Guild, National Book Critics Circle, and Small Publishers, Artists & Writers Network.